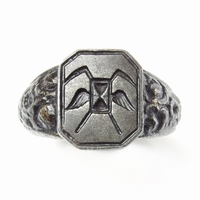 Rare Berlin iron signet ring. The bezel is showing a harp with a sitting person reading a book, flower to the right and monogram L W. Ring band is decorated with a floral motif. 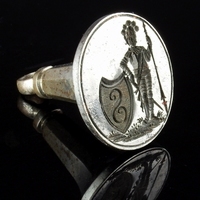 This rare ring dates from around 1810-1820, originating from an old German collection. As iron is susceptible to rusting not many pieces have survived. This ring is in very good condition with no visible signs rusting. Care should be taken to keep this ring dry.